ASYMCO에서 지난 해 휴대폰 시장의 시장 점유율과 이익 점유율을 발표했다. 애플의 괴물같은 실적은 어느 정도 짐작은 했지만 이 정도일 줄이야..
애플은 총 판매대수 중 9%를 팔아서 39%의 매출을 점유하고, 무려 75%의 이익을 가져갔다. 지난 4분기 휴대폰 시장의 총 이익이 150억불로 추정되고, 애플은 그 중 3/4을 독식. 판매대수는 노키아에 이어 2위, 매출액과 이익은 애플에 이어 각각 2위를 차지하여 나름 체면을 유지했다. 삼성과 애플의 이익을 합치면 91%. 노키아, 림, HTC, LG 등 나머지 기업은 전체 이익율 9%를 나누어 갖는다. 지독히 냉혹한 승자독식의 비즈니스 현장의 장면이다. 노키아는 삼성보다 판매대수가 15%정도 높은데도 불구하고 매출액이 절반에 불과하다. 여전히 싼 피처폰에 의존하고 있기 때문일 것이다. 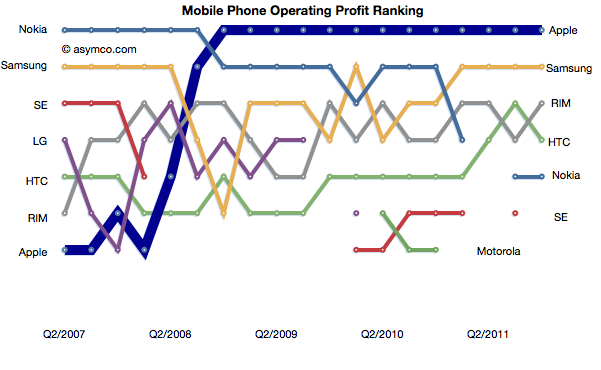 Apple retained its top rank in profitability and regained the top spot in mobile phone revenues. 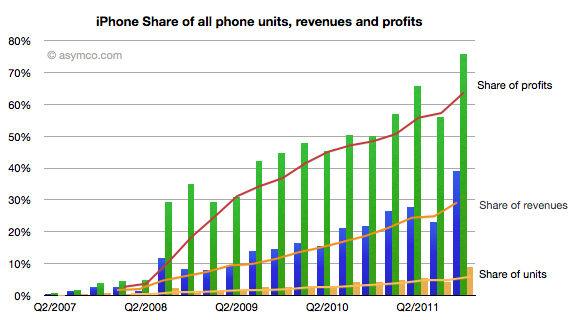 Apple reached 75% of profit share, nearly 40% of revenue share and 9% of units share. Apple and Samsung combined for about 91% of profits with RIM third at 3.7%, HTC fourth at 3.0% and Nokia last at 1.8% of a $15 billion total for the quarter. 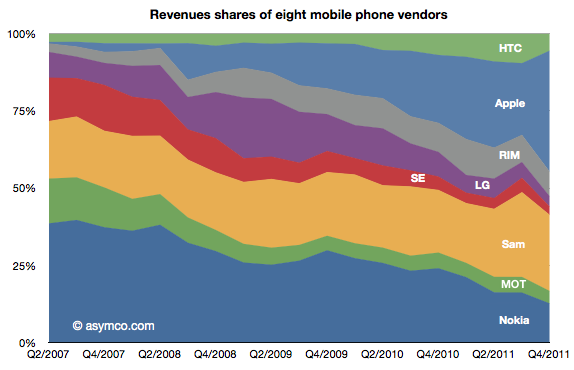 In terms of revenues, Apple had 39% to Samsung’s 25%. 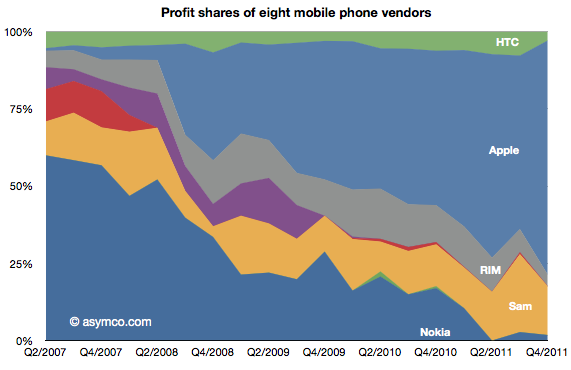 Third was Nokia with 12.6% and fourth RIM at 8%. HTC only managed 5.5%, Motorola 4%, LG 3.3% and Sony Ericsson 2.7%. Research firm IDC today released its estimates of global mobile phone sales for the fourth quarter of and full-year 2011, finding Apple moving past LG to claim third place in the rankings for the first time. Apple was rapidly closing on LG by mid-2010, but fell back into fifth place behind ZTE during the third quarter as customers held off in anticipation of new iPhone hardware. The strong surge from the iPhone 4S launch was then enough for Apple to move up in the year's final quarter and by a large enough margin that it was able pass LG in full-year numbers as well. While Apple has been estimated to be neck-and-neck with Samsung for the crown of top smartphone manufacturer, Nokia and Samsung firmly hold down the top two spots in the overall mobile phone rankings on the volume of their lower-end feature phones. Apple jumped into the third spot globally from the fifth spot last quarter thanks to a record-breaking quarter of shipments. 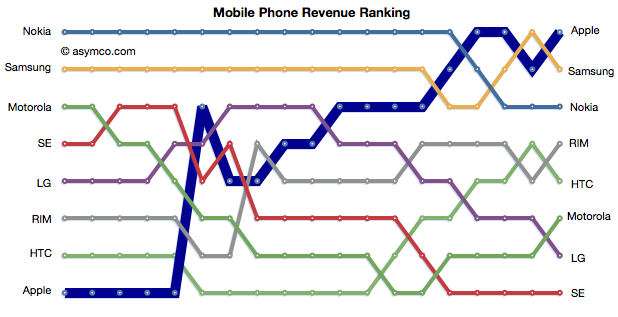 That represents the Cupertino-based company's highest-ever ranking on IDC's Top 5 global mobile phone leaderboard. The launch of Apple's iPhone 4S smartphone, which is now available in over 90 countries (as of mid-January), was the primary reason the company leapt over LG and ZTE in 4Q11. Device sales in the U.S. and Japan were particularly strong given extra sales days in the quarter and carrier distribution. Apple's share of the market hit 8.7% in the fourth quarter and registered at 6.0% for the full year. Steve Jobs famously noted during the iPhone's 2007 introduction that Apple was shooting to take 1% of the massive overall mobile phone market, and the company has clearly exceeded that goal and can now set its sights on a 10% quarterly share during the next spike in sales. One year ago, Apple ranked fifth in both fourth quarter and full-year sales for 2010, but by nearly doubling its sales year-over-year Apple was able to overtake both ZTE and LG to move into third place.